Telecommunications technology is constantly changing and improving – seemingly faster and faster every year – and at Teracom, we keep our training courses up to date to reflect these changes. In a previous post, we identified eight major developments and trends in telecommunications incorporated in our training. MPLS has replaced ATM for traffic management, achieving another long-held goal in the telecommunications business, called convergence or service integration. A long-held goal in the telecommunications business has been to transport and deliver all types of communications on the same network and access circuit, and in an ideal world, with a single bill to the customer. This idea is sometimes called convergence, though service integration is a more accurate term. It results in a large cost savings compared to different networks, access circuits and bills for each type of communications. In days past, this was not the case. A residence would have at least two entry cables: twisted pair for telephone and coax for television, and separate bills for each. The situation was even worse and more expensive in the case of a medium or large organization. • Data, video and possibly voice to/from the Internet. • DSL, Cable or T1 access from an ISP for data, video and possibly voice to/from the Internet. Not only did this mean four services and four access technologies and four bills for the customer, it also meant the carrier had to implement and support four network technologies… a very expensive situation. • Paste an identifier on the front of each piece of traffic, indicating what it is and where it goes. 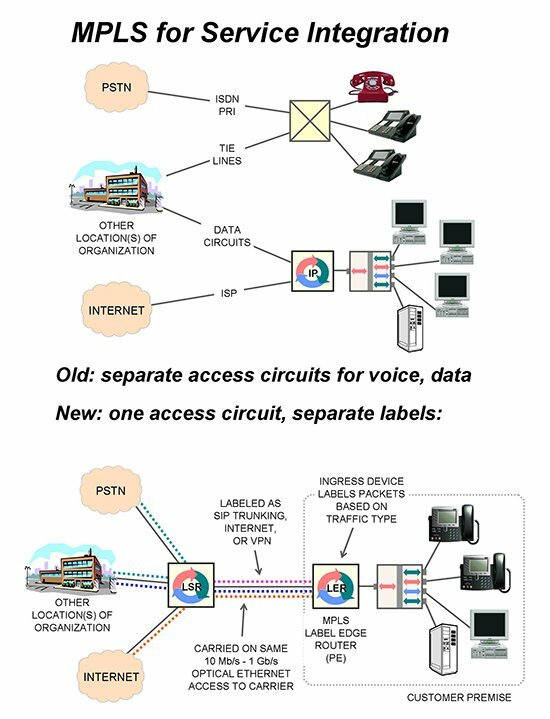 Then all traffic can be carried interspersed on the same access circuit and in the same network, which results in a huge cost savings for both the customer and the carrier. The identifier on the traffic is used to both route the traffic to the correct destination, and manage the traffic in the network, performing functions like load balancing, prioritization and restoration. Starting in the 1980s, telephone companies and equipment manufacturers attempted to implement this with a technology called Asynchronous Transfer Mode (ATM). Literally billions of dollars were spent developing and deploying ATM from 1980 to 2000… but it failed and died, becoming too complex and too expensive, and not used for voice at the big telephone companies. Multiprotocol Label Switching (MPLS) combined with IP has succeeded where ATM failed and is now universally implemented. Of course, there is a lot of jargon to learn and many components to the “MPLS” story. • All traffic is formatted into IP packets by the equipment that generates it, for example, a telephone or computer. • Traffic is categorized into classes. A class of traffic goes from the same place to the same place and experiences the same transmission characteristics like delay and lost packets. • A packet is identified as belonging to a particular class by pasting a number called a label on the front of the IP packet. • The device that does the classification and labeling of packets is the ingress device, called a Label Edge Router in MPLS. It is normally Provider Equipment (PE), meaning owned and furnished by the service provider, located at the customer premise. • Network equipment, called Label Switching Routers in MPLS, use the label number to route and in some cases prioritize the packet. • Labels can be stacked, meaning one label pasted in front of another. This allows the network to manage similar kinds of traffic as a single entity in network control systems. Returning to our example illustrated above, the four circuits illustrated at the top of the diagram can be replaced with one access circuit with three traffic classes (three labels). The physical access circuit could be 10 Mb/s to 10 Gb/s Optical Ethernet. • A traffic class for telephone calls. This might be called a “SIP trunking service” by the marketing department. This class will carry VoIP phone calls to the carrier for communication to other locations of the organization, or for conversion to traditional telephony for phone calls to the public telephone network. • A traffic class for data. This might be called a “VPN service” by the marketing department. This class carries file transfers, client-server database communications and the like securely to other locations of the organization. • A traffic class for Internet traffic. This class carries anything in IP packets to the Internet. All of this traffic is IP packets interspersed over the single access circuit. At the other end of the access circuit, the carrier uses the label to route the traffic onward and possibly prioritize it to assure the appropriate service level. The result is all of the organization’s traffic carried over a single access circuit, using a single technology. This is one of the Holy Grails of the telecommunications business, called convergence or service integration, having significant advantages in cost and flexibility. This is a concise description of a story that has many different facets. In Teracom training, this discussion comes AFTER many other lessons explaining all of the underlying concepts, related technologies like PRI and SIP trunking and their jargon. and DVD-Video Courses V3 and V4. Previous Previous post: Would you attend this course?